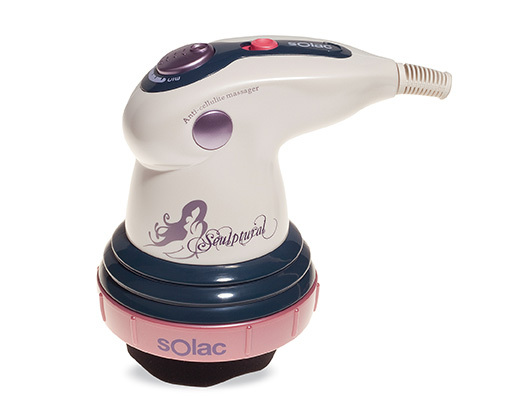 Home Products Solac Massager With Attachments Plastic White W "Sculpture"
Solac Massager With Attachments Plastic White W "Sculpture"
Relaxing, soothing and effective against cellulite and orange peel skin. Mould your figure with the triple action massager. Professional lipo modeling system that effectively fights cellulite and flaccidity at home. Triple action: eccentric circular massage, pneumatic pressure and infra-red heat. Professional technique: gives subcutaneous massages that increase blood flow, helping to eliminate toxins and reduce accumulated fat. Result: sculpts your figure and smoothes "orange peel” skin. New parallel spiky disk massage head of semi-rigid silicone for thighs and buttocks: removes cellulite, reduces flaccidity, stimulates blood flow, tones, and reduces volume. Can be used together with anti-cellulite products for a more powerful effect.